Temperament: Shy and sweet - warms up quickly to people. Metro Pet Market, through their Spay It Forward initiative, has sponsored Jane’s spay, as part of their ongoing mission to foster responsible pet ownership. For more information on Metro Pet Market, visit metropetmarket.ca or find them on Facebook. Jane and her five litter mates somehow ended up homeless and outdoors during some of the coldest winter weather. Luckily, a kind woman found them and took them into her home, but not before the kittens had suffered frostbitten ears and paw pads. The kittens have enjoyed TLC in foster care and are now ready for forever homes. Jane was a bit shy when she first arrived in care, but didn’t seem to mind her vet check too much. She quickly adjusted to her busy foster home with two dogs, multiple cats and pre-teen children. 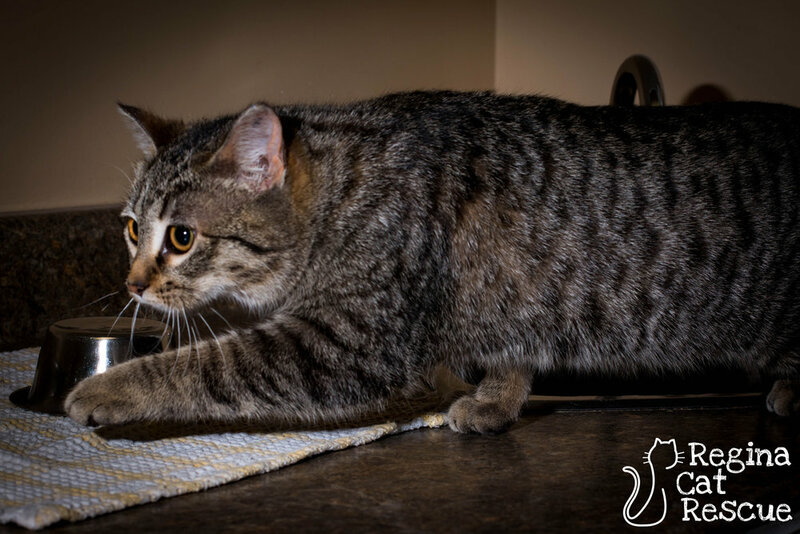 Jane is a naturally curious and playful kitten who enjoys attention. Now that her days of hardship are behind her, Jane has her sights set on a loving forever home that will keep her safe and give her the love she deserves! If you’re interested in Jane, click here to view our adoption contract and click here to complete an adoption application or email the RCR Adoption Coordinator at adoptions@reginacatrescue.com for more info.